People aged 65 years and older have higher rate of emergency department (ED) use than other age groups. Critically ill older ED people have specific characteristics. Older patients with life-threatening conditions often present with atypical signs and symptoms unspecific of the altered organ or tissue, and often usual severity criteria are missing. Some symptoms such as delirium, faintness, general malaise, digestive problems, fatigue, balance impairments, or falls can be incorrectly regarded as mild, whereas they are the only sign of a life-threatening condition. Even small initial insults in patients with multisystem deterioration and loss of physiological reserve (frailty) can induce a disabling cascade of adverse effects, called the “domino” effect, which can threaten the life of older patients. Determining whether the older patient is frail, i.e., his (her) medical, psychological, and functional ability to cope with the acute condition, is therefore crucial in older ED patients for optimizing therapeutic options and anticipating treatment adverse effects. Ethical consideration and whether the patient has an advanced directive, health-care power of attorney, or living will on admission are also crucial parts of the assessment of older ED patients. 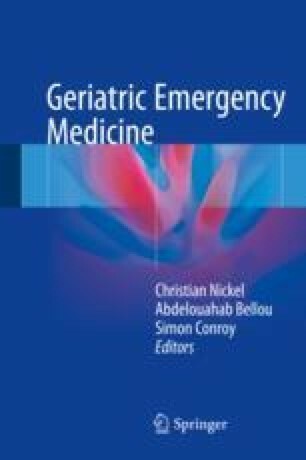 The present chapter displays a model of geriatric secondary assessment adapted to critically ill older ED patients that takes into account the above specificities and particular needs of these patients.